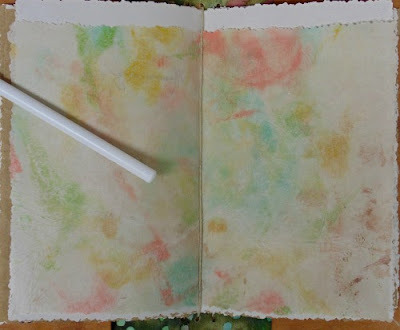 Journals - Junk journals, Travel journals, Art journals, Collage journals, Writing journals - whatever you want to call them or use them for, they can easily begin with Eileen Hull's Journal. Eileen's newst collection of dies from Sizzix are called Heartfelt. In this collection is her fabulous Journal die. I have several dies that were designed by Eileen and I can honestly say that they are my "go to" dies for many, many of my projects. 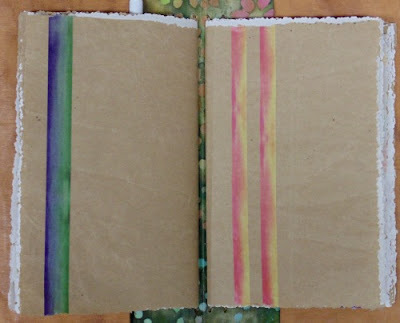 Here I will share the first one that I made using the Journal die. First let me just say I LOVE trying different approaches to using all the creative elements at my finger tips. It seems that I always go first to fabrics and papers. Another LOVE is "found" items, the reuse/recycling of any materials, so for this journal I combined these and more. Begin by die-cutting the journal from matboard and assembling the covers by using a strong glue or Thermoweb Super Tape™. I then covered the inside with a fabric remnant and adhered it will gel medium. Fold over the edges of the fabric for neat, even edges. Apply a top coat of gel medium and allow to dry. Poke the holes with a hole punch or piercing tool when dry. The cover was made with Kraftex®. It is a paper-like fabric that can be used in many ways. Die-cut it, paint it, sew it, wash and distress it, stitch it, fold it! It's a great surface to work with. I measured a piece that was slightly longer then the length of the cover (top to bottom) so I could add stitching. 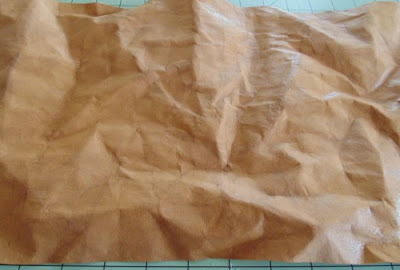 To give the Kraftex® a faux leather look, I wet the material with warm water by running it under the faucet. Once wet enough, wrinkle it up as much as possible. This step can be repeated over again. Once enough wrinkles are made, smooth it out and allow the material to dry. NOTE: You can hasten the drying with a hair dryer or ironing it slightly, just don't iron out all the wrinkles. 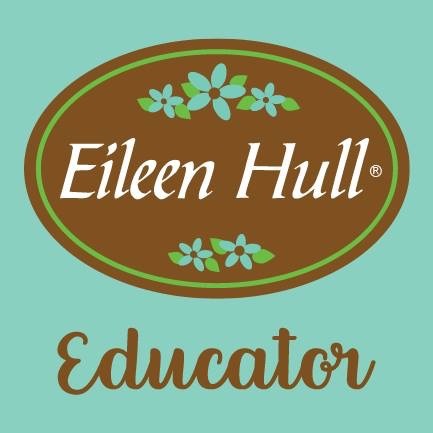 When dry, using the nutmeg Colorbox™ Blends by Eileen Hull, lightly pass the ink over the entire surface, adding as little or as much color as desired. Allow ink to dry. 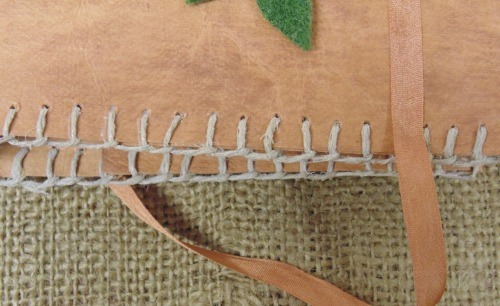 To form the cover, place the matboard journal on the faux leather piece and make the folds necessary to fit. Once the fit is correct, creases the folds well with a bone folder. Poke the holes for the binding and finish with any perferred binding. 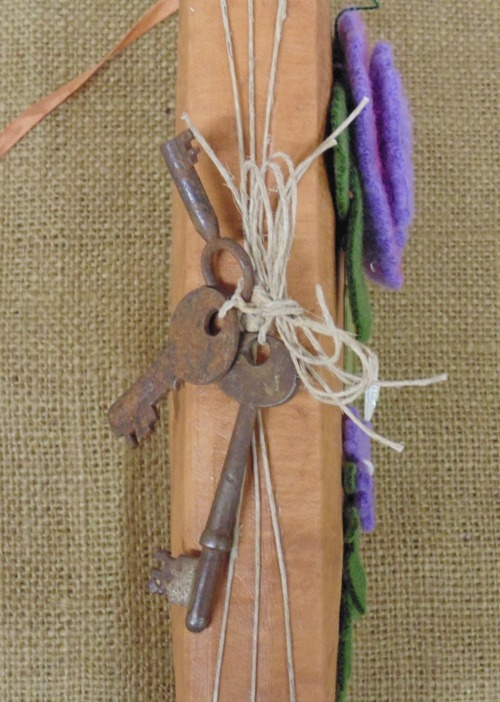 For this journal a thin jute cord was used for the signatures and the edging stitches. Make markings with a pencil along the top and bottom edges, approximately 1/4" apart. 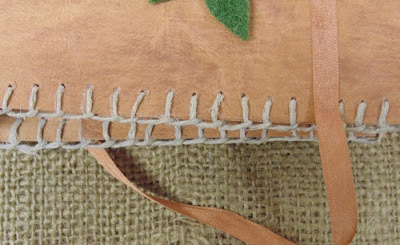 Stitch along both edges using a blanket stitch (even a simple running stitch works). Coat the faux leather cover with an application of gel medium. Allow to dry. The embellishments are made from washed wool that were finds on an thrift store trip with Eileen last Fall. Of course the shapes are from Eileen's other collections of Sizzix dies. The larger "Romance" flower has a couple layers colored with the wildberry Colorbox™ Blends. Two of the "extras" on the journal die were colored and used. The label/faceplate piece was used as part of the button closure, while the "closure" piece was attached to inside flap of the cover as a pen holder. 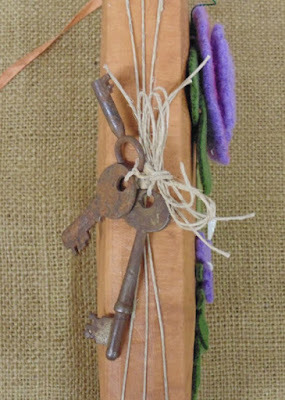 Simple pearl stick-ons, pearl buttons, old rusted keys and silk ribbon finish off the cover of the journal. The page inserts are made from the packing paper that was used in mailings that I received. * You know - never throw anything away, it might come in handy! * The papers were ironed flat, then measured and trimmed with a paper trimmer. 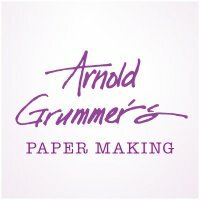 Make three signature with the paper pages by folding in half and trimming the three outside edges with deckle decorative scissors. 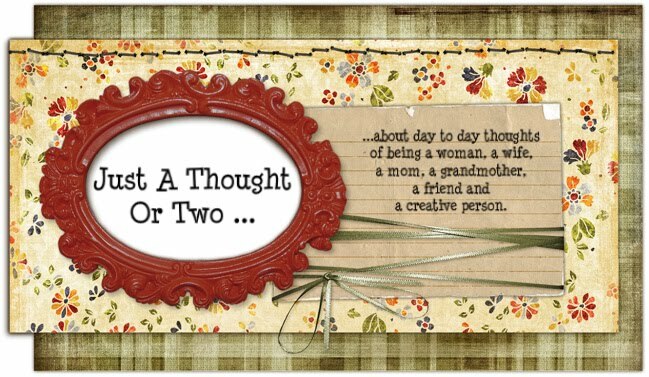 Paint, draw, letter or just add some washi tape for decoration on the front pages. NOTE: Some the packing paper I had was almost as thin as tissue paper and I fused sheets together with Pellon Wonder-Under® following manufacturer instructions. These sheets add some interest since they were slightly translucent but still will take ink. One sheet had some Blends slightly wiped over areas before fusing. This a wonderful, versatile die that makes journal making easy, fun and as creative as you would like! 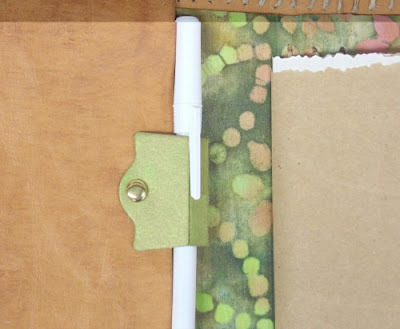 I will be sharing some other journal ideas using another interesting cover material, combining some new products for mixed media by another designer friend and another take on "faux leather" with brown paper. Ideas are endless! 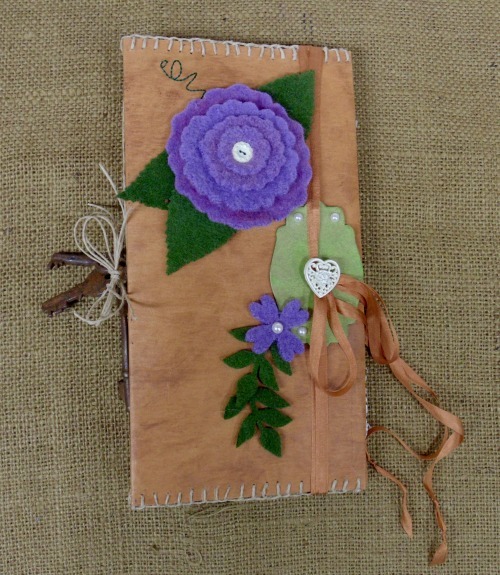 Go to Eileen Hull Designs FB Page to see more ideas for journals and other creative ideas.